The Northern Territory Department of Correctional Services' Datjala work camp is providing a ready workforce for not-for-profit groups in Arnhem Land. 'Open' security prisoners are working through community work parties for local not-for-profits and through Sentenced to a Job (STAJ) with local businesses. Datjala work camp has contributed more than 8700 hours to community groups in Nhulunbuy this financial year, including building a shade structure for the Gove Peninsular Surf Lifesaving Club. Datjala prisoners clean beaches, run rubbish collection services, prepared the Garma Festival site and perform grounds maintenance for several local not-for-profit clubs. The work camp is of mutual benefit to the community groups of Nhulunbuy who get assistance with their projects and maintenance whilst the prisoners gain valuable experience and training. 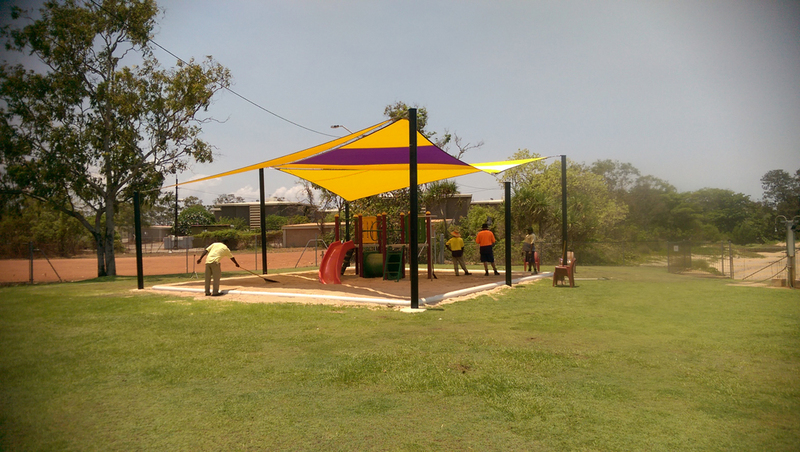 Datjala prisoners working on the playground at Gove Peninsular Surf Lifesaving Club.